Joseph Lukens, Brian Williams, Nicholas Peters, and Pavel Lougovski, research scientists with ORNL's Quantum Information Science Group, performed distinct, independent operations simultaneously on two qubits encoded on photons of different frequencies, a key capability in linear optical quantum computing. Qubits are the smallest unit of quantum information. "To realize universal quantum computing, you need to be able to do different operations on different qubits at the same time, and that's what we've done here," Lougovski said. 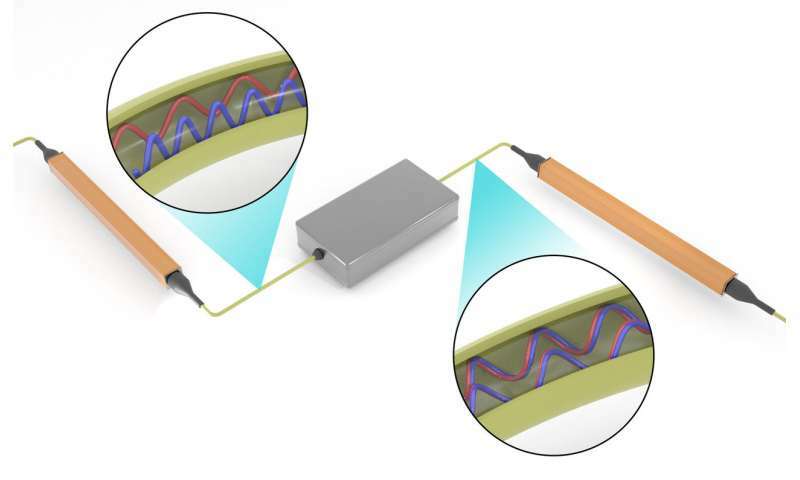 According to Lougovski, the team's experimental system—two entangled photons contained in a single strand of fiber-optic cable—is the "smallest quantum computer you can imagine. This paper marks the first demonstration of our frequency-based approach to universal quantum computing." Unlike data bits encoded for classical computing, superposed qubits encoded in a photon's frequency have a value of 0 and 1, rather than 0 or 1. This capability allows quantum computers to concurrently perform operations on larger datasets than today's supercomputers. Using their processor, the researchers demonstrated 97 percent interference visibility—a measure of how alike two photons are—compared with the 70 percent visibility rate returned in similar research. Their result indicated that the photons' quantum states were virtually identical. "We were able to extract more information about the quantum state of our experimental system using Bayesian inference than if we had used more common statistical methods," Williams said. "This work represents the first time our team's process has returned an actual quantum outcome." Williams pointed out that their experimental setup provides stability and control. "When the photons are taking different paths in the equipment, they experience different phase changes, and that leads to instability," he said. "When they are traveling through the same device, in this case, the fiber-optic strand, you have better control." "There are steps you have to take before you take the next, more complicated step," Peters said. "Our previous projects focused on developing fundamental capabilities and enable us to now work in the fully quantum domain with fully quantum input states." 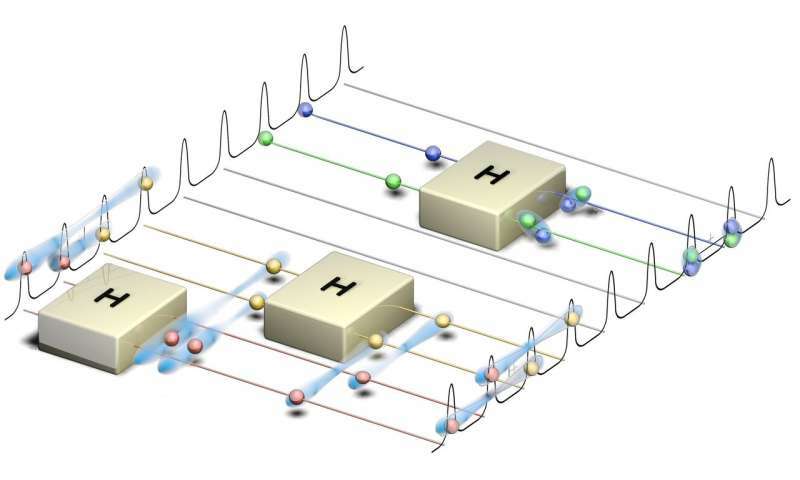 Lukens said the team's results show that "we can control qubits' quantum states, change their correlations, and modify them using standard telecommunications technology in ways that are applicable to advancing quantum computing." Once the building blocks of quantum computers are all in place, he added, "we can start connecting quantum devices to build the quantum internet, which is the next, exciting step." Much the way that information is processed differently from supercomputer to supercomputer, reflecting different developers and workflow priorities, quantum devices will function using different frequencies. This will make it challenging to connect them so they can work together the way today's computers interact on the internet. This work is an extension of the team's previous demonstrations of quantum information processing capabilities on standard telecommunications technology. Furthermore, they said, leveraging existing fiber-optic network infrastructure for quantum computing is practical: billions of dollars have been invested, and quantum information processing represents a novel use. The researchers said this "full circle" aspect of their work is highly satisfying. "We started our research together wanting to explore the use of standard telecommunications technology for quantum information processing, and we have found out that we can go back to the classical domain and improve it," Lukens said.